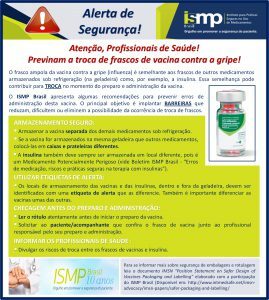 April 30, 2016 - On this D Day of flu immunization in Brasil, awareness is needed on confusion between insulin and vaccines as stated by an ISMP Brasil Alert following a serial error that occurred last Thursday 28 April 2016 in the community hospital of Maringá (North Paraná) where fifty employees received a dose of insulin by error instead of the influenza vaccine. The nurse in charge of the vaccination of the hospital staff took the wrong box in the refrigerator where insulin and vaccine against influenza were stored. She has been confused with the packaging and administered the wrong substance to her colleagues and to herself. The administration of vaccines began at 9 am, and the error was spotted around 10am. Given the error, staff members who have been "vaccinated" with insulin received a glucose injection. To avoid problems, all were hospitalized and remained under observation until 21h. So far, fortunately, no employee showed any adverse effects. 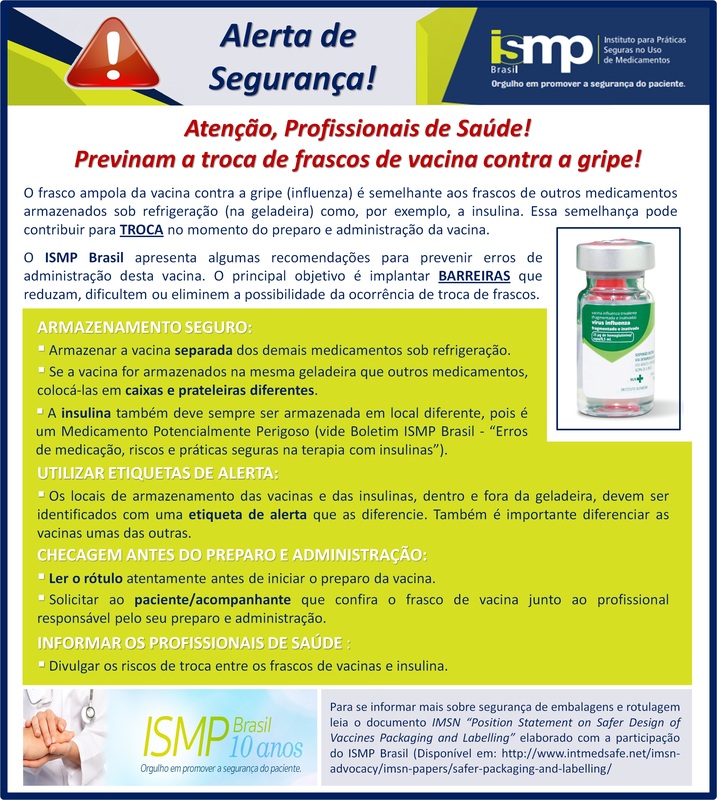 Although having already alerted healthcare professionals about the risks of errors involving vaccines in a bulletin on insulins and on neuromuscular blockers, ISMP Brasil takes advantage of a National Safety Alert on this confusion between insulin and influenza vaccines occurrence to highlight the need for learning front of the internally identified errors and other health institutions; and to present some recommendations to prevent medication errors involving vaccines. • World Health Organization "Global manual on surveillance of adverse events following immunization" 2014; page 21. • Institute for Safe Medication Practices (ISMP) "What else is stored in a refrigerator with influenza vaccine?" ISMP Medication Safety Alert! Acute Care 2014; 19 (24): 1. • Shanks L et coll. "Learning without Borders: A Review of the Implementation of Medical ErrorReporting in Medecins Sans Frontieres" PLoS One 2015; 10 (9): e0137158. And fatal confusions involving muscle relaxants are more serious and more worrying. The International Medication Safety Network (IMSN) has made it the starting point of its International Position Statement on Safer Vaccine Packaging and Label Design, calling on 14 December 2015 for greater worldwide attention to the problem of unsafe design of vaccine packaging and labelling. This entry was posted in Uncategorized on April 30, 2016 by Étienne Schmitt.